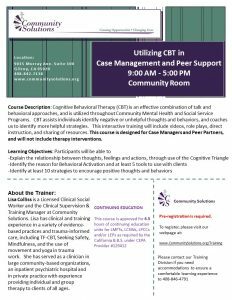 Cognitive Behavioral Therapy (CBT) is an effective combination of talk and behavioral approaches, and is utilized throughout Community Mental Health and Social Service Programs. CBT assists individuals identify negative or unhelpful thoughts and behaviors, and coaches us to identify more helpful strategies. This interactive training will include videos, role plays, direct instruction, and sharing of resources. This course is designed for Case Managers and Peer Partners, and will not include therapy interventions.